Evergreen Hedging Plants - Evergreen Hedges - Hedging Evergreens. It is difficult to overstate the value of evergreen hedging plants in the garden, they can provide welcome shelter, structure and privacy throughout the year. You can browse our complete range of hedging evergreens on this page, all grown here on our own nursery in Kent. Evergreen hedging plants – Evergreen hedges are primarily grown for year round privacy but they also provide attractive barriers to both noise and pollution and make excellent windbreaks giving shelter to wildlife and of course to the garden. 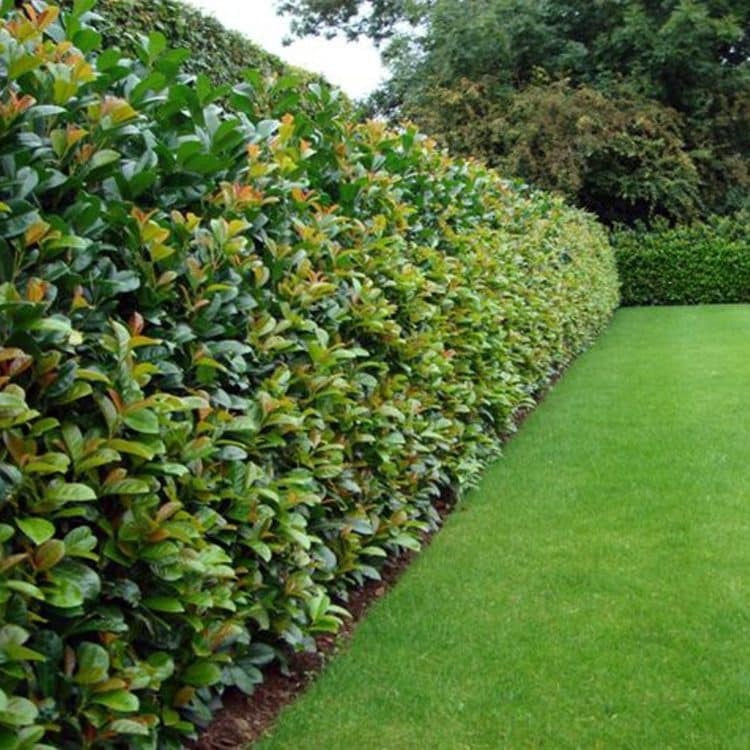 Evergreen hedging is a softer more gentle way of providing a private screen for your property and are much less likely to get damaged in harsher windier weather than a fence or wall. Not all evergreen hedging plants have to be clipped into tight formal hedging less formal evergreens such as Escallonia, Cotoneaster Lacteus, Photinia Red Robin or Viburnum Tinus make stunning evergreen hedges in a more relaxed manner and if left untrimmed or not trimmed too harshly these pretty evergreens produce flowers and berries giving yet more interest in addition to drawing in birds and wildlife to enjoy the fruits. For a manicured and more formal hedge, take a look at Box, Euonymus, Griselinia, Japanese Holly, Portugal Laurel, Leylandii, Lonicera, Thuja….and of course – English Yew hedging plants, the king of hedges! We stock all of these formal evergreen hedging plants here on the nursery, many of them in a wide range of sizes. Evergreen hedges with thorns such as Pyracantha, Berberis Darwinii or Berberis stenophylla not only provide screening but add security to properties when knitted together. Smaller evergreen plants make excellent edging for paths borders and beds giving form and definition to the garden when other plants have lost their leaves or flowers. Variegated evergreens such as Euonymus Gold or Silver or Spotted Laurel hedging plants also give continued colour with their multi coloured leaves being retained throughout the year. Most evergreen hedging plants benefit from feeding with an evergreen hedging plant feed in springtime to ensure the quality and colour of their foliage and consistent watering as this will also aid leaf retention if it is dry in autumn and spring. There are many more evergreen shrubs, trees and hedging plants to be found below. If you need any further help choosing an evergreen hedge or a special quote for a bulk order over £1000 please call our friendly team on 01580 765600 or get in touch through our contact page.